Since I don't think you guys want to see me answer 33 questions about myself, I am just going to pick and choose from all the questions! Ps thanks to Autumn, Lauren and Diana for tagging me. All the cool married kids were doing it so I was super pumped when I got engaged so I could start blogging. I now realize you do not need to be married/involved to have a blog, some of my favs are the single ladies. At first it was just to document the newlywed life, but as I started reading and following others, I wanted my little blog to grow, so that is where it is at right now, budding stage! Help a girl out. Who inspires you most in your life? My baby sister Hailey. She was born really early-1 pound 3 ounces and was in the hospital for over a year straight. She is so special. She has gone through so much in her small life so far, more than I have in my 23 years. She is happy and tender and such a blessing. My number one thing is I want to be close to my family. I want my kids to be able to see their grandparents on a daily basis if they so desire. BUT family aside, I love Seattle....although I have never been there...I just have a thing for Grey's Anatomy and ferries! Oh Sheesh. Maybe this one about my severe TV addiction, it is pretty cray cray. Or maybe all about my need for a happy ending? Or maybe on a more mushy note my husbands bday post last year where I tell you how smitten I am. Stephan Salvatore, from TVD. And I am so selfless/married that I don't even want him for myself, just for Elena, because as you know from above I NEED a happy ending, so get it together Vampire Diaries. I also have it in for my two Canadian loves-Mr. Gosling and Mr. Bieber. Oh my oh my how I love J. Crew, I wish I could dress from head to toe in the crew. They are so expensive and I scour the store and site for sales though. What cheers you up on a crappy day? Easy. my bed. my husband. eating out. talking to my mom on the phone. bubble bath with Philosophy Bubble Bath. And retail therapy like Cher from Clueless. Nails, spring nail colors! I love nail polish, as seen in this post, and this post. So I am itching for it to be seasonally appropriate to bust out the pastels. Wow this is a hard one. A mom of one. maybe two. on a ferrie? When people blow their nose and look at it. And burping. Something about me that might surprise people? I cannot for the life of me NOT swallow my gum. almost immediately. I put in my mouth and it tastes too good, so my mouth just swallows it. I would go through a pack a hour. I hope the seven year myth is not true or I am in serious trouble. 2.If you could change one thing about yourself what would it be? 3.Chocolate or Vanilla? Think about it. 4. Your favorite movie genre? 6. The greatest lesson you have learned in the last year? 7.Gun to your head.Have you pick just one.favorite movie? Just one. 8. Where do you see yourself if five years? 10. Random fact about yourself? 11. Favorite way to relax? Remember if you have already done one of these or don't want to, no worries, just if you feel so inclined. and loved reading these answers! Hi Cassie! Just found your blog. I'm also a Canadian living in the U.S.! (from Toronto, live in Virginia now). Love that you guys are Canadian too! You blog is adorable and I'm so glad I found it! Yay! Thanks for tagging me :-) I actually did this last month (or was it the month before?) but I also had to list 11 interesting facts about myself. It was a struggle, let me tell you. Also, I have a problem swallowing my gum also, but not the minty kids so much. Just any fruity, juicy kind. Thanks for the tag, can't wait to answer these fun questions! I love your answers haha you crack me up. I have a little sister named Hailie too (spelled different). love how you didnt tag me....whats up with that???!!! Such a cute blog! And I LOVE Seattle too! Oh I will so do this! Your sister sounds like a hero for everyone. Also bubble baths do truly heal all wounds. Loved this! :] And I totally watch Grey's Anatomy all the time so I think we need to take a trip to Seattle! Find out how awesome it really is! Haha. And I really need to do this post! I have been tagged but I have never done it and now I feel bad because I don't remember everyone who has tagged me! Dang it! But thank YOU for tagging me!! What an adorable post and great blog you have! cass im not good at this blogging stuff. what do i do? just write one on my page? do i have to link up again? BTT (behind the times) love you! ha! how fun. i love these types of questionnaires. this post was fantastic! I loved reading about YOU! So, we have the same celeb crush. 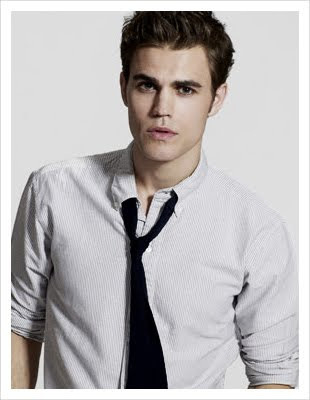 I love him so much and I love vampire diaries! that's funny you love Seattle but have never been there, i have those kind of thoughts about a lot of places too though I can't really pinpoint why I love somewhere I've never been! Funny you got into blogging because you thought it was a married club :) I read all kinds of blogs- married, single, men's... it's just so neat getting insight into everyone's little worlds (which sounds creepy). and aw, your Sister has been through a lot!